There was something about the trailer for the film, The Book Thief, that intrigued me, but I hadn’t read Markus Zusak’s 2006 novel by the same name, on which the movie was based, so I walked into the theater unsure of exactly what to expect. The movie, set in World War II-era Germany, and narrated by Death (voiced by Roger Allam), focuses on the experiences of 11-year-old Liesel (Sophie Nélisse). Liesel is adopted by a German couple after her mother abandons her. Her new mother, Rosa Hubermann (Emily Watson), is a bit of a witch (That’s her word, not mine, although I admit that I thought it before Rosa spoke it.). Fortunately, her new father, Hans Hubermann (Geoffrey Rush) could win the father-of-the-century award hands down. Liesel’s life is also enriched by her new best friend, Rudy (Nico Liersch), and a mysterious young man, Max (Ben Schnetzer), who appears one night on her new family’s doorstep. Liesel and her friends and family live in poverty and are haunted by the constant fear induced by war, but, through the bright and hopeful eyes of Liesel, the movie isn’t depressing. The performances are spectacular. 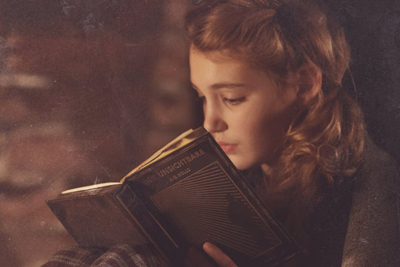 Nélisse is intelligent and captivating as Liesel. Both she and her young co-star, Liersch, deftly avoid the look-how-cute-I-am acting that plagues too many young performers. 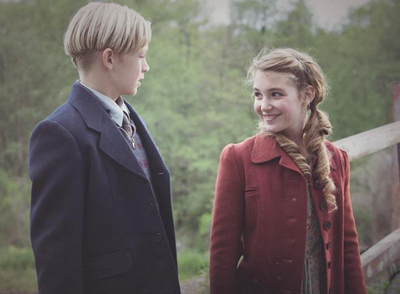 Rush is brilliant; his love for Liesel radiates from the screen and touches the hearts of the audience. I wasn’t expecting any laughs considering the subject matter of this film, but Watson provided to be an unexpected and welcome source of subtle humor. The film is visually exhilarating. The appealing, warm colors; gorgeous, often snow-covered scenery; detailed, multilayered wardrobe; and the infinitely-dimensional sets are a feast for the eyes. John Williams scored the film, and while the score is no Harry Potter, Indiana Jones, Star Wars, E.T. or Jurassic Park and will not end up on my iPod, the music serves the movie well. I felt that there were scenes where director Brian Percival could have tightened up the film a bit from its 131-minute running time, but spending a little extra time with this film is a gift. It also felt a bit strange that the German characters spoke only English (aside from two subtitled songs and an occasional “nein” instead of “no”), but if the dialogue had been recorded in German and then given English subtitles or dubbing, it would limit the film’s audience, and that would be a shame. The ending of the movie was sad, but satisfying. I left the theater feeling hopeful, despite the fact that the narrator, Death, opened the movie by reminding us that we are all going to die. Our deaths are easier to accept when we have truly lived. And, ultimately, that is what The Book Thief is about: love, loss, and living. The Book Thief opened in theaters November 8, 2013. The Book Thief is rated PG-13. * Jen attended a complimentary screening of The Book Thief.